Your home is one of your most valuable assets. A remodeling project or renovation can be a big investment. Finding the right contractor for your project is essential to achieving your desired outcome. Your contractor must be able to implement the design of the project, coordinate the work and bring together the right team of people to get the job done. 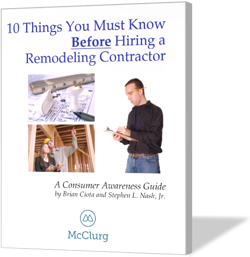 Download the How to Hire a Contractor Kit to learn the facts about the remodeling business and what you should consider before selecting a contractor for your next remodeling project.